The biggest surprise about the Nisqually earthquake was that it wasn't worse. "It used to be, I never really thought much about it," said Oregon State University marine geologist Chris Goldfinger. "Now I sit in my building — the kind that pancakes in an earthquake — and I'm thinking: I hope it doesn't go now." "The hazard has certainly gone up, but it's a reflection of our increased knowledge," said Brian Sherrod, a U.S. Geological Survey (USGS) scientist stationed at the University of Washington. 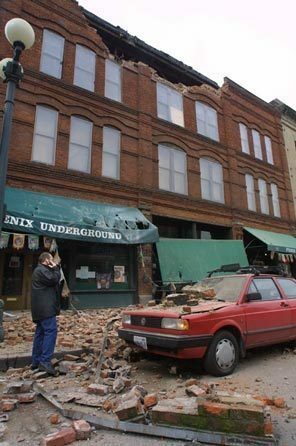 The new insights are beginning to inform construction and emergency planning, said Craig Weaver, the USGS' regional seismic-hazards chief. "Ten years ago, we were in an exploratory phase. Now we have much more certainty about what we might expect to happen." "We're astounded by the number of big faults we're dealing with," Weaver said. "I'm working on three more right now," he said. "We haven't even really begun looking south of Olympia." The key to unlocking the region's seismic past was the airborne laser scanner called LIDAR. The technique filters out vegetative cover and creates topographic maps that strip the landscape bare. Potential faults stand out like broken bones on an X-ray. "That completely changed everything," Sherrod said. Another bit of unsettling science suggests that instead of being tucked well offshore, Cascadia's danger zone — the portion of the fault that would snap in an earthquake — may be closer to Seattle, Portland and Vancouver, B.C., than previously thought. The evidence comes from the study of the recently discovered phenomenon called "silent earthquakes." Seismologists "listening in" on the Olympic Peninsula have detected tiny vibrations they believe are produced as the geologic plates in the subduction zone slip past each other. A network of more than 400 GPS stations across the Northwest is able to measure that slip, along with all the other tectonic wrenching that makes the region such fertile earthquake ground. A decade ago, there were only about a dozen of the stations, said Central Washington University geologist Tim Melbourne. Some experts remain unconvinced the danger zone lies within a scant 50 miles of the Interstate 5 corridor. "The jury is out; but if it's true, it has to be taken seriously because of the implications," Goldfinger said. The result is the nation's most sophisticated seismic-hazard map. The map identifies vulnerable areas — including the basins beneath Seattle, Tacoma and Everett — and it predicts the expected level of shaking. "We don't have to wait until the big earthquake occurs to know where the bad places are," Frankel said. The modeling hasn't been factored into building codes — but Frankel hopes it will be. "It's on the edge between research and application." "A big subduction-zone quake will be pretty bad," Frankel said. "We're trying to figure out how bad."